In the end, what emerges most powerfully from The Longest Night is a kind of quiet wonder at the exquisite intricacy, but astonishing durability, of familial love. Thank you to generous Instagrammer “booksfordessert” for this beautiful photo and the nice words about The Longest Night. Here we are, Pub Day! The Longest Night hits bookshelves today. It feels strange and exciting to finally reach this point. I started writing when I was about five years old. I have wanted to be a novelist ever since that time, and it took about three decades, but it’s happened. The run-up to publication has been a happy one, with The Longest Night named a Barnes and Noble “Discover Great New Authors” pick and the Amazon “Featured Debut” for January 2016. I’m very grateful for all this, but the book would be nothing without the most important folks of all — the READERS! So thank you for your interest, thank you for reading, thank you for your love of what I think is some of the best stuff in the world: books, and talking about them. For more on The Longest Night and my writing process, check out a piece I wrote yesterday for Medium.com (“Men at Work: The Unexpected Freedom of Writing Male Characters“), read a review I just love on Peter Molin’s fabulous blog Time Now, and read an interview with me on Deborah Kalb’s “Book Q&A” blog. Big thanks to everyone who’s read, commented, or posted reviews – I’m grateful for all of it. A few folks have mentioned to me that they’d like to give a copy of The Longest Night as a gift for the holidays, but there’s one wrinkle — the book comes out 2 1/2 weeks after Christmas. Should you find yourself in this terrible bind, I have a solution! I’ve made up these nice, glossy little cards you can give in a box or envelope letting someone know that you’ve pre-ordered them a copy and that as soon as the book comes out in print on January 12th, one will be sent their way. I’m sending these out as a courtesy so if you would like any, just drop me a line at longestnightbookclubs@yahoo.com. I’ll pop them in the mail for you. I can write a note to the recipient as well. 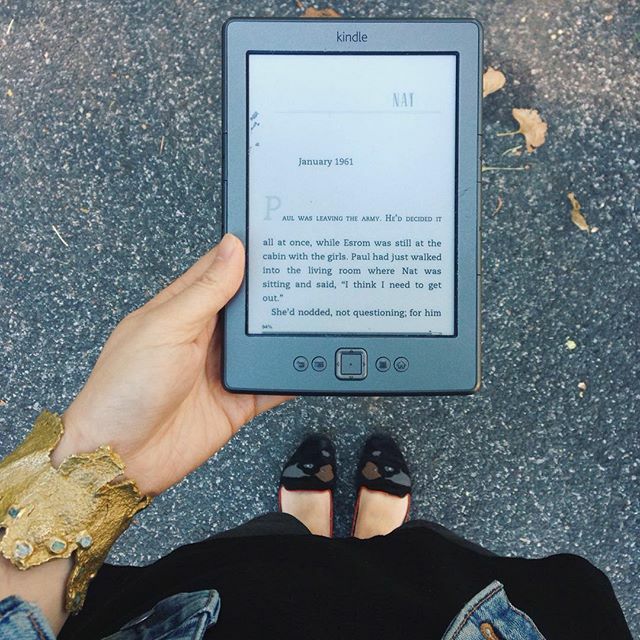 Spotted on Pinterest: A young woman with impeccable taste in bangle bracelets, shoes, and — in my humble opinion — literature! Enjoy the Fall weather, kind reader, and your book!